Attendant jobs. Candidates will be selected based on written test and Language Proficiency Test LPT only for this Office Attendant jobs. Online applications for this RBI Office Attendant jobs will be available from 17-11-2017 to 07-12-2017. Candidates must have apply for their respective region. Written/Online test will be held in December 2017 or January 2018. 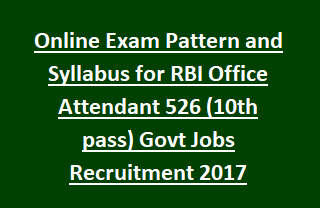 Here we are providing the exam pattern, syllabus for this RBI Office Attendant jobs. Online applications will be accepted through official website of www.rbi.org.in or through http://ibps.sifyitest.com/rbioattoct17/. Complete information about exam pattern, syllabus, cutoff and other details are given below. Note: Degree qualified candidates are not allowed to apply. Only 10th pass candidates are allowed to apply. Written Exam will be conducted country wide. Candidates who are qualified online exam they will be eligible for Language Proficiency Test LPT which will be held in Regional Languages. Written exam will be conducted for 120 marks. Total 120 questions will be given and each question having one mark. RBI Office Attendant Exam duration is 90 minutes. Written Test will be conducted in both Hindi and English languages except General English subject. Candidates may select their preference at the time of online application form submission. There will be 1/4 negative mark for each wrong answer. Download Exam Syllabus here for RBI Office Attendant Jobs. LPT Test will be conducted in respective candidate regional language. LPT is qualifying purpose only for this RBI Office Attendant Jobs. Candidates who are qualified in Written exam they are only eligible for attending the Language Proficiency Test.